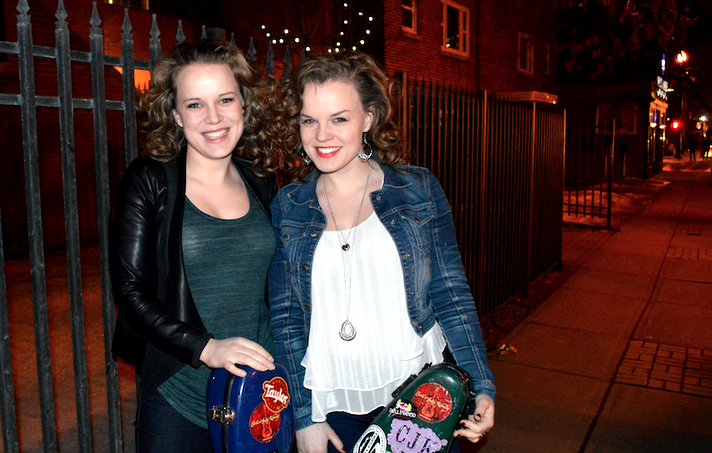 Meet Canada's newest country duo - Twin Kennedy. Well, that actually isn't true. They've been around, touring and writing songs as Carli and Julie for years. Since they were children they have been playing instruments and singing for any audience that would have them. They have always been Carli and Julie, or the twins, or the Kennedys - but I guess it was time to make a name that sounded a little more...like a country duo. Before they made their next album they decided it was time to find something that would stick. "We knew for a year that we wanted to make a change, something that was easy...we thought of Dear Kennedy, Miss Kennedy..." said Julie. "...we really wanted to keep Kennedy, but then everyone always came back to the twin thing," said Carli. They became Twin Kennedy...if there was ever a more country sounding duo name I don't know what that would be. Maybe Cowgirls on Hay-Bales...but I think I like Twin Kennedy more. The sisters have a new single to go along with their new name, It's a Love Thing. The single was released on iTunes this week. "The song is very much our theme. It's a Love Thing. If you come to our shows it's about our family, and love and why we do what we do. Our music is pretty uplifting and makes people feel pretty happy," said Julie. "That's why we put it out first, to tell people what we're all about," said Carli. They have spent the last 3 years writing songs, hanging out on the road and working towards the release of their upcoming LP which was produced by George Canyon and Greg Sharkey. They are currently on radio tour across Canada prior to the release of the LP in the Spring. I asked the girls if they had any touring horror stories from the early days and they did not. How is that possible? I don't know, some people are just born with horseshoes in their bones I guess. I can't go on a trip longer than an hour without some disaster occurring. I told the girls they needed to learn how to exaggerate on small, possibly insignificant events to have better stories to tell people like me - who live for the drama. I will make sure to follow up next time they are in town and dish the deets of any touring fiascoes that may have occurred...or did not occur. Don't get too excited, it'll probably be the latter. For more information on their current tour go here.